Saturdays are always fun days in the showroom. The pace is more relaxed and the phones are reasonably quiet, and we get to focus on having good conversation with the folks that meander through the store. There are a few questions that we have come to expect at some point most every Saturday… one is usually regarding the feasibility and durability of marble countertops (which we LOVE for certain applications, and will certainly delve into that one in another post), and another is whether it’s okay to have a master bathroom without a tub. The answer of course depends on your circumstances; in many cases, we have removed tubs from masters and used the space to create luxurious showers and house extra storage. As long as there is a functional tub in a secondary bath, the master tub can be made optional. There is much to gain in a larger shower, and with our busy lifestyles, the tub sometimes does very little other than collect dust! However, we certainly do not want to be too quick to dismiss the tub. Tubs are often the visual centerpiece of the room, and can provide a much-needed retreat after a hard day. There are many features available in tubs, often referred to as hydrotherapy. Benefits can include pain relief, skin softening effects, and stress reduction. 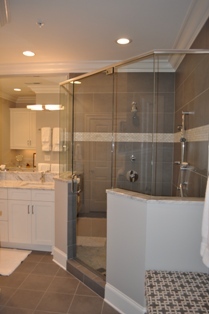 The decision of whether or not to include a tub in your master bathroom renovation is one that should be carefully considered, and one that we are glad to help you work though.